“J,” Howard Jacobson’s Man Booker Prize shortlisted novel, is being described as both Orwellian and dystopian. The book’s narrative is brilliantly and chillingly depicted sometime in the not too distant future. Jacobson, through hints and allusions, reveals the occurrence of a second Holocaust suffered by the Jewish people. Inconceivable, you say? Yet, it is a fact that in today’s Europe, Jews have become marginalized once again. Jews are leaving France in droves due to the overt anti-Semitism there. Throughout Europe, observant Jews wearing conspicuous yarmulkes are often targets of verbal, and occasionally, physical abuse. Jacobson utilizes a heavy dose of Swiftian and Rabelaisian satirical wit to make the inconceivable conceivable. Reading “J” requires patience. You will find yourself rereading passages as it is easy to miss cogent allusions as the story unfolds. Once you finish the book, there is a sudden realization that you have read a masterpiece, subtly terrifying as it may be. Due to the internationalization of the Prize, effective this year, Ferris and Fowler become the first Americans to be shortlisted. Flanagan is an Australian and the other three authors are British. Jacobson is the only one of the group that has previously won the Man Booker Prize for The Finkler Question (2010), although Ali Smith was previously shortlisted twice with The Accidental (2005) and Hotel World (2001). The winner of the competition will be announced on October 14. 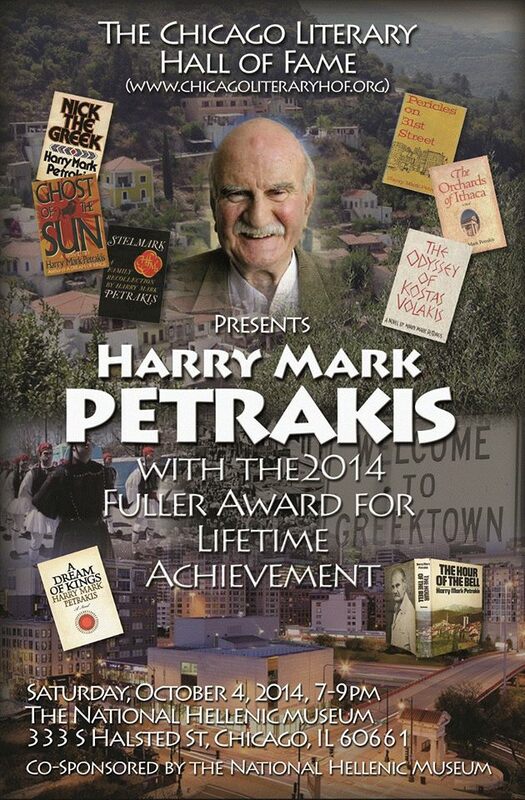 I was in Chicago’s Greek Town today talking to folks and passing out promotional materials about the upcoming tribute for author Harry Mark Petrakis. Harry, now 91 years of age, will be receiving the Chicago Literary Hall of Fame’s 2014 Fuller Award for lifetime achievement. As I went into Greek restaurants, groceries, bakeries and candle shops I saw the faces of the people that Harry writes about in his stories, the hard-working, family-focused dreamers and chasers of the elusive American dream. Harry has received much praise and adoration over the years in Chicago’s Greek-American community. Now the greater Chicago literary community joins them in raising our glasses of retsina to him on Saturday evening, October 4, 2014, from 7:00-9:00 pm at the National Hellenic Museum, 333 S. Halsted in the heart of Greek Town. I have never met Harry, but I have read many of his books that exude so much humanity and soul. I can’t wait to meet him that night. I hope that you will join me there. For more information on the event check out the Chicago Literary Hall of Fame website at http://www.chicagoliteraryhof.org. As Richard Flanagan writes in his Man Booker longlisted novel The Narrow Road to the Deep North, “a good book…leaves you wanting to reread the book. A great book compels you to reread your own soul.” This is indeed a good book by that definition, and at times Flanagan tries ever so hard to make us, the readers, reread our own souls through his compelling narrative, but somehow he falls short in doing so. About a half the book is set in a Japanese Prisoner of War camp in the Siamese jungle during the Second World War. The Australian POWs are being forced to clear the jungle to make way for a railway that will connect Siam and Burma, thus allowing the transport of Japanese troops to embark on the invasion of the Indian subcontinent. Flanagan’s own father, in actuality, was one of those surviving POWs, although all the characters in the novel are fictionalized. The horrific conditions of living and dying among these prisoners are brilliantly depicted by the author. The reader must have a strong stomach to tolerate the unbelievably brutal scenario that Flanagan lays out in describing the suffering of the enslaved Aussie POWs. As the cliché says “war is hell” and this jungle hell comes out right at you in Flanagan’s book in an emotional gut punch. The protagonist, Dr. Dorrigo Evans, is a complex character, and the novel, through third person narration, recollects the doctor’s life, especially his imprisonment in the camp and his role as the ranking officer among hundreds of Aussie slave prisoners. Evans’ pre-shipping off to war romance with his young aunt, is written with an absorbing passion that draws the reader into the raw emotionalism of the narrative. I wouldn’t be surprised at all if this very good book is selected for the Man Booker shortlist that will be announced next week.